MyBrainSolutions (MBS) works with employers across the country to improve the mental fitness and wellbeing of their employees and increase engagement and productivity. MBS is the first mental fitness assessment and training tool that looks at the entire set of interconnected brain capacities that drive an individual’s performance. Through careful assessment and benchmarking, MyBrainSolutions provides scientifically-based pathways with specific training exercises that help improve brain capacity, increase positivity, and reduce negative feelings and behaviors that hinder employee productivity and performance. Castlight and MyBrainSolutions together work to improve employees’ productivity and performance through brain health exercises. 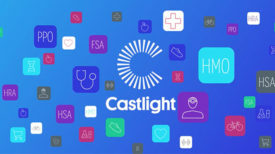 Castlight’s health navigation platform targets the total population with content, reminders and communications about MyBrainSolutions total wellbeing solution for better focus and positivity in the workplace. Together, MyBrainSolutions and Castlight work to improve the mental wellbeing and productivity of employees. MyBrainSolutions is connected to the Castlight platform via a deep, data exchange integration. As users engage with MyBrainSolutions, they earn points in Castlight for completing specific micro-actions, like taking new brain health assessments, which also helps power Castlight's personalized recommendations. Example micro-actions are shown. Employees can track their progress managing their through an MBS module. Employees can earn points when they work toward accomplishing specific health goals.